A ‘route of shame’ took place today in London to mark United Nations Human Rights Day. A small delegation from UNISON, the TUC and Amnesty International UK visited a number of embassies and high commissions in London to hand in letters of protest. The diplomatic missions of Bahrain, Colombia, South Korea, Qatar, Swaziland and Turkey were on the ‘route of shame’ as they are countries that systematically violate workers’ rights: rights that are guaranteed in international law. Thousands of trade unionists around the world have lost their lives standing up for workers’ rights and social justice. Countless others have suffered, and continue to suffer, persecution and denial of their fundamental rights to freedom of association and assembly. The ‘route of shame’ took place to remind these countries that workers’ rights are synonymous with human rights, and as such, merit protection. TUC President and UNISON assistant general secretary Liz Snape handed in, or attempted to hand in, letters setting out how these countries consistently violate international treaties. The countries were chosen because the International Trade Union Confederation (ITUC) in its Global Rights Index ranks them as amongst the worst violators of workers’ rights. The Universal Declaration of Human Rights protects the right to freedom of assembly and association, and the right to join a union. The International Labour Organisation (ILO), an agency of the United Nations, has, for nearly 100 years adopted conventions that promote and protect workers’ rights, including the right to strike. Despite many countries’ paper commitments to guarantee these rights, the reality for many people, especially those who choose to join a union, is the opposite. Systematic abuses of workers’ rights have resulted in trade unionists being the victims of murder, kidnap, violent attack, intimidation, harassment and blacklisting. More recently, a number of countries including the UK, which is currently debating the Trade Union Bill, have sought to legislate to limit the ability of unions to operate as free, civil society organisations. These developments contravene international law and UNISON believes must be challenged. When the delegation arrived at the embassy of Turkey, security staff refused to accept the letter. The letter stated that the Turkish government has repeatedly banned unions from taking strike action, and has restricted numerous protests. The Turkish government ‘has displayed a growing intolerance towards critical journalists, arresting many, as it attempts to censor information on a number of issues, including the plight of the Kurdish people. Trade union confederations DISK and KESK have been subjected to particular harassment. Amnesty International said the authorities have become more authoritarian in responding to critics’, said Liz Snape. The embassy of Colombia accepted the letter and agreed to look into the case of Huber Ballesteros. Colombia is labelled ‘the most dangerous country in the world to be a trade unionist’. Hundreds of political prisoners languish in jail. Many of them are trade unionists, including Mr Ballesteros. He is the vice-president of agricultural union FENSUAGRO and a member of the executive of the Colombian TUC, the CUT. Huber was arrested in August 2013 as he was about to leave to attend the annual TUC in Britain. He was charged with funding rebellion, and sedition. He was the subject of an urgent action on Human Rights Day 2014 as part of a collaborative effort by UNISON, Justice For Colombia and Labour Start. Despite repeated calls for his release, Huber Ballesteros continues to languish in jail, and after 28 months in prison he has still not been tried. This is a clear denial of his human rights, as is the refusal of the prison to allow him a diabetic diet and access to an ophthalmologist for an eye condition that is probably related to his diabetes. 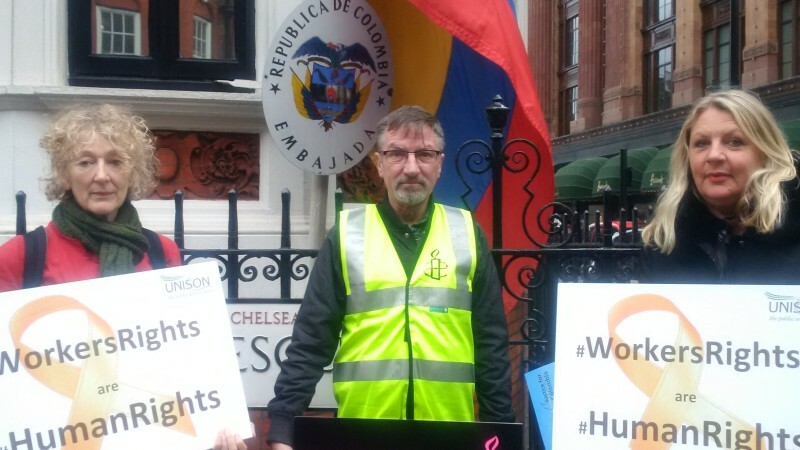 The delegation was pleased to hear that the embassy would pass on concerns about Huber’s medical condition and let UNISON know in the next few days but as Justice for Colombia have been campaigning for his release for over two years, we are not that confident he will be seen by a ophthalmologist this weekend. The official at the Bahrain embassy said the case of teachers’ union leader, Mahdi Abu Dheeb, would be ‘looked at’. Mahdi has been in prison since 2011. Amnesty International made him a prisoner of conscience, and is campaigning for his release. They said his imprisonment is solely because he defended teachers’ rights. The Korean embassy accepted the letter and told UNISON to make an appointment if we wished to see the ambassador. We pointed out that we had notified them of our visit but had received no reply. While we were there we received news that the Buddhist monastery where Han Sang-gyun, leader of the beleaguered KCTU in South Korea, was taking refuge had been raided by the police. A more forthcoming welcome was afforded the delegation at the High Commission of Swaziland, and the letter received by a representative of the High Commissioner. UNISON was told that a meeting request would be considered. Liz Snape told the representative that UNISON recognised that progress had been made in Swaziland, namely allowing the Trade Union Congress to register, but she said attacks on freedom of association continue, and were real cause for concern. The Qatar embassy resorted to calling the police when the delegation attempted to deliver the letter. Needless to say they refused to accept the letter. It ironic that Qatar, ever critical of the ITUC and the TUC’s Playfair Qatar campaign for not producing ‘facts’ would not engage with the delegation, as they could have obliged. Qatar is due to host the World Cup in 2022 and the World Athletics Championships in 2019. The 1.5 million migrant workers in Qatar are subject to an employment system called Kafala which ties a worker to the sponsor (usually the employer). This system has been widely criticised, and the ITUC and human rights organisations have called for its abolition. Qatar tried to block a vote at the ILO recently, and now has to respond to the ILO’s decision to send in a high-level mission to conduct an investigation into the appalling conditions migrant workers endure in the wealthiest country on earth. 7,000 workers are expected to die before a ball is kicked in 2022. There are 140 countries of the United Nations with diplomatic offices in London. UNISON could have chosen many of these for special attention as attacks on workers’ rights means hard-won rights are being abolished across many countries. As the UK government seeks to downgrade trade union rights and protection for people at work here, it is imperative that the union movement sticks together to ensure that rights are not eroded further, and those workers with no rights have some form of protection in law. It is our moral responsibility to stand in solidarity with workers to ensure their rights are upheld. In my book you cannot have rights with out responsibilities. They’re different sides of the same coin. What on earth does that have to do with the article? Has everyone seen this about Jeremy Corbyn? I kid you not, Jeremy Corbyn intervened to secure bail for someone convicted of conning old people out of their life savings in order to fund Islamic terrorism. Yes, it’s good to stand in solidarity with workers abroad, but how about people standing in solidarity with workers in the UK?? Too many issues focus on other countries. How about focussing on the poverty on your own doorstep? Charity begins at home, after all. And if you read the article in full, it was BEFORE the accusations of terrorist links were announced. I.e. he wrote a letter on behalf of his constituents only being given half the facts. Now that can happen to anyone including you or I, so be careful what you claim as it could happen to you in another way such as being told half the facts if one of your friends and their partner split up, internal family disputes etc.